I've been using ProDrive turbines for over a year now. The aftermarket replacement turbines and handpieces made by them have been a tremendous plus for both myself and my patients. In fact the January issue of Dental Products Report has my article on why I'm such a raving fan. Montreal, March 9, 2010 – ProDrive Systems announced today the release of the W&H Synea TA96 upgrade turbine model. 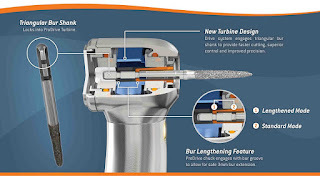 ProDrive’s patented turbine and bur system lock together for a noticeable increase in cut speed, control and precision. The ProDrive triangular bur shank and upgrade turbineprovide long-term, durable enhanced performance. ProDrive upgrade turbines ship with a push button back cap and a comprehensive 1-year warranty, including bearings. ProDrive products are available through authorized dealers across the United States and Canada.Contact ProDrive Systems or your local dealer to experience the ProDrive difference. ProDrive Systems Inc. is revolutionizing high-speed handpieces with its Triangular Bur and engaged drive Turbine System that improves the performance of dental handpieces and enhances practice efficiency. Visit www.prodrivesystems.com for more information.